One-third of the Bald Eagles admitted at Tamarack tests positive for lead toxicity. In 2018 four Bald Eagles and one Common Loon were treated for lead poisoning. In 2017, seven eagles were treated for the toxin. Across the U.S. 25% of 3,000 eagles examined by the National Wildlife Health Center had lead toxicity. Extensive research has shown eagles and other avian scavengers such as vultures become poisoned most commonly by ingesting the remains of animals hunted with lead ammunition. Loons and water birds can be poisoned by ingesting lead jigs or fishing weights. Choosing to use non-lead ammunition and fishing tackle, or burying hunted remains that are left in the are great ways to prevent this. Once suffering from high levels of lead toxicity, it is difficult for an eagle or other bird to recover. 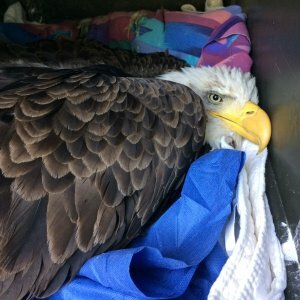 In the fall of 2017, Tamarack received widespread media for treating seven lead-poisoned Bald Eagles in the course of just two months. Tamarack’s commitment to preventing and treating lead poisoning continues and exciting progress is being made. Prevention of lead poisoning in wildlife is easy if people know what to do, so educating both hunters and the general public about what they can do to protect eagles is a top priority. After being informed by input from Tamarack, other wildlife centers, and the research of state veterinarian Dr. Justin Brown, the commissioners of the Pennsylvania Game Commission (PGC) committed to help educate about this issue in 2017. A brochure and educational video were produced by the PGC in 2018. Additional outreach is being made as Tamarack volunteer and Allegheny College Environmental Studies professor, Dr. Ben Haywood published an article on lead poisoning of eagles and its prevention in the Jan/Feb 2018 issue of the PA Sportsmen’s Club’s journal “On Target”, reaching a wide audience. Executive Director Carol Holmgren gives a presentation “Hope for Eagles: Preventing Lead Poisoning in PA Eagles”, to both sportsman’s clubs and environmental organizations. If you are interested in having this important and inspiring presentation for your group, contact us! 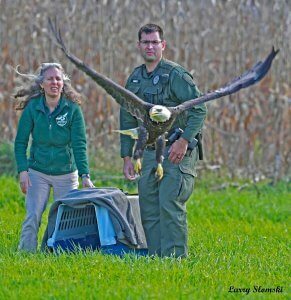 Only one of the seven eagles admitted in 2017 survived to be released. We suspect these eagles acquired the toxin from eating woodchucks or other “nuisance wildlife,” since they became ill at a time when hunting seasons were not open. Our center is ready to treat lead poisoned wildlife at any moment, to give them the best possible chance for survival. 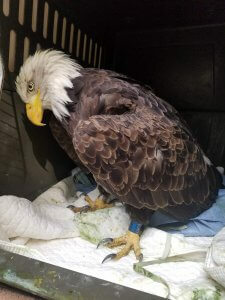 In 2018 a new blood lead testing unit was purchased at a cost of $2,200 to replace our decade-old outdated one, and medications and medical supplies costing hundreds of dollars are maintained onsite in order to give eagles and other wildlife patients the best care possible at a moment’s notice. Through Tamarack’s efforts in education and treatment, our state’s eagles are safer.